Pitchers and catchers will report to Tampa one week from tomorrow, which means my annual top 30 Yankees prospects list will be posted this Friday. The whole thing is written. Pretty sure this is the earliest I’ve finished it. I just need to proofread it a few more times and all that. Friday’s the day though. Here are some minor league notes to help pass the time. Noticeably absent: 3B Miguel Andujar, who ranked in the middle of other top 100 lists these last few weeks. In the chat, Jeffrey Paternostro said he is “just not an Andujar guy. I don’t love the swing or the throwing at third. He keeps making it work though, and I fully admit I may be too stubborn here.” To each his own. That is the lowest Torres appears on a top 100 list this year and, holy crap, also the highest Andujar appears. No other top 100 list has him higher than 54th. 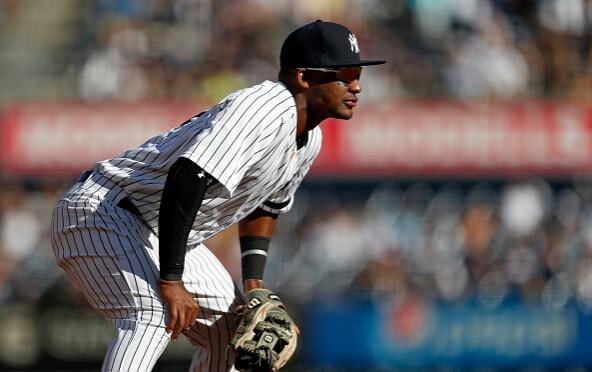 “Andujar has cut down on his swing-and-miss while also lifting the ball more and hitting it with more authority, an obviously rare and desirable combination when you’re already working with a toolsy prospect who was always young for his level,” says the write-up. Love it. The Yankees have drafted well, they’ve scouted very well internationally, and they’ve kept most of the “right” guys in trades so far, such that their system is No. 2 in all of MLB even after promotions and a few deals. Their Trenton (Double-A) and Scranton Wilkes-Barre (Triple-A) affiliates should be extremely fun to watch this year. That is an awful lot of right-handed pitchers. Law also mentions C Saul Torres, OF Billy McKinney, RHP Ben Heller, RHP Domingo German, and SS Hoy Jun Park in the write-up, and labels Medina as his sleeper. “Luis Medina is incredibly exciting, just a long way off, but he could be the next great starter prospect in what looks like a line of them from the majors on down,” he writes. LHP Justus Sheffield doesn’t make the list, and in the write-up, it is said “if he were projected to pitch in a less homer-friendly stadium than Yankee Stadium, Sheffield moves back into the top 100. In fact, as a Tampa Bay Ray he would get up to No. 68.” So there you go. Blame the ballpark for the Yankees not having a fifth ZiPS top 100 prospect. The Yankees have signed well-traveled LHP Ryan Bollinger to a minor league contract, it was announced during an Australian Baseball League broadcast. Bollinger, 26, was drafted by the Phillies in the 47th round of the 2009 draft, but did not sign. He spent 2010 in an independent league, 2011-13 in the White Sox system, 2014-16 in independent leagues, 2017 in Germany, and this offseason in Australia. He’s made nine starts with the Brisbane Bandits and thrown 54.1 innings with a 3.48 ERA and a 75/12 K/BB this winter. Would be something if this guy made it, huh?
? In other transaction news, the Yankees have released RHP J.R. Graham, reports Matt Eddy. Graham came over from the Twins in a cash trade in May 2016, managed to spend the rest of the season on the 40-man roster, then was outrighted last year. The 28-year-old allowed 19 runs in 20.1 innings with Triple-A Scranton last season before going down with an injury in June. The Yankees have so many bullpen arms for Double-A and Triple-A in the system. It would’ve been tough to find room for Graham. Baseball America (subs. req’d) tabbed RHP Luis Medina as one of nine breakout prospects for 2018. 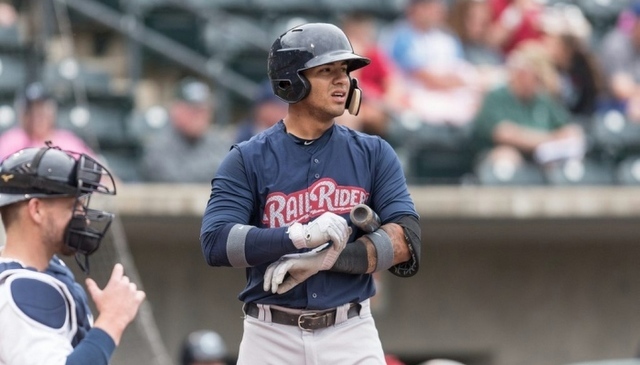 “The Yankees’ system is full of powerful, high-end arms, and Medina might have the highest ceiling of them all … Medina has an excellent chance to find himself in next year’s Top 100 Prospects,” says the write-up. The Trenton Thunder are rebranding themselves as the Trenton Pork Roll. For real. The Associates Press has the story. It’s for Friday nights only this season, starting May 18th. The team will wear special jerseys and “sell pork roll sandwiches and pork roll-themed merchandise” at the ballpark. Pork roll-themed merchandise? Pork roll-themed merchandise. Over the last several weeks, the Yankees have announced the coaching staffs for their various minor league affiliates. Minor league coaches are the unsung heroes of any organization. These are the folks who work directly with the top prospects, and right now the Yankees sure do have an awful lot of top prospects. Here’s a quick rundown of minor league coaching staffs for the upcoming season. Pedrique is returning to the RailRiders after being named International League Manager of the Year last season. Scranton won the division title, the IL championship, and the Triple-A Championship Game. The RailRiders went 91-52 last year, becoming the first IL team to win 90+ games since 2002. Pedrique has climbed the managerial ladder from Low-A Charleston (2013) to High-A Tampa (2014) to Double-A Trenton (2015) to Triple-A Scranton (2016-17). He served as Astros bench coach from 2010-11 and was briefly the Diamondbacks interim manager in 2004. Pilittere is a new addition to the Triple-A staff. He was the Double-A hitting coach the last two years after holding the same role with Tampa (2014) and Charleston (2013). I’m sure many longtime RAB readers remember Pilittere from his stint in the organization as a player. This is already his sixth year in the system as a coach. Crazy. He was always considered a future coach during his playing career because of his leadership skills. Pilittere will be in charge of Clint Frazier’s development this summer. Also new to the staff is Davis, who is not to be confused with former big league lefty Doug Davis. This is a different Doug Davis. This Doug Davis was the Blue Jays minor league catching coordinator from 2010-16. He’s been coaching or managing in the minors since 1995, and spent the 2003-04 seasons as the Marlins bench coach. Slater, London, and Hyde are all holdovers from last year. This will be Mitchell’s second season in the organization and second as manager of the Thunder. Trenton went 87-55 last season before losing the Eastern League Championship Series. Mitchell has big league coaching experience with several teams as an outfield and baserunning coach, and prior to joining the Yankees, he managed in the Cubs and Angels systems. Rosado (third year) and Closser (second year) are also returning to Trenton. Slater replaces Pilittere after spending the last two seasons as hitting coach with High-A Tampa. This will be his ninth season in the organization. He’s held all sorts of coaching and managerial positions over the years. Slater will be the guy overseeing Gleyber Torres and Miguel Andujar this year, among others. Diaz is being promoted from the rookie Gulf Coast League while both Downam and Velasquez were with Low-A Charleston from 2014-16. Welcome to the Yankees, Jay Bell. The former two-time All-Star joins the organization after spending the last 12 years or so holding all sorts of jobs, including big league bench coach (Diamondbacks from 2005-06, Reds from 2014-15), big league hitting coach (Pirates in 2013), and special advisor (D’Backs from 2007-09). Perhaps Jorge Mateo will one day have an out-of-nowhere 38-homer season like Bell after having him as a manager. Norton is back with Tampa for the second straight season. This will be his fifth season coaching in the organization after injuries sabotaged his promising playing career. Duncan, New York’s first round pick in 2003, joins the Tampa staff from Staten Island. This is his first full season coaching gig and third season coaching with the Yankees. Last year it was reported farm system head Gary Denbo wanted Duncan to coach full-time, but he wasn’t willing to commit to it yet. Apparently now he is. Over the last few years Hernandez has emerged as the Yankees minor league catching guru. Last year he worked with Luis Torrens in Charleston, and the year before he was with Gary Sanchez in Trenton. The Yankees don’t have a notable catching prospect ticketed for Tampa, though I suppose Torrens could wind up there if (when?) the Padres return him as a Rule 5 Draft pick. Dominguez is coming up from the rookie Gulf Coast League and is one of the longest tenured instructors in the organization. He’s been around since 2006. Becker is entering his fourth year with Tampa while Dunning is coming up from Staten Island. By all accounts Osborn is a rising managerial star in the farm system, which is kinda funny because he’s being moved down from Tampa to Charleston this year. He’s going to have a fun roster. Blake Rutherford, Dermis Garcia, Estevan Florial, Isiah Gilliam, Leonardo Molina, and Hoy Jun Park could all be with the RiverDogs in 2017. It’s not a coincidence the Yankees chose Osborn to work with those prospects. Osborn joined the organization in 2014 after spending several years managing the independent Southern Maryland Blue Crabs. Joyce is a new addition to the organization. This will be his 21st season coaching in the minors, so he’s been around. Joyce spent the last five years with the Giants. Prior to that he was with the Marlins and Blue Jays. Pope, yet another former Yankees minor leaguer turned coach, returns for a second season as Charleston’s pitching coach. Rabago was a 2009 draft pick by the Yankees and is already in his fourth season as a coach. He’s joining Charleston after spending the last two seasons with rookie Pulaski. Javier, Sole, and Dolan are all new hires. This will be Mosquera’s third season as a manager and 12th as an instructor with the Yankees. He spent the last two years in the rookie Gulf Coast League, and prior to that, he was the club’s longtime catching coordinator. Mosquera worked with every catching prospect from Frankie Cervelli to Jesus Montero to John Ryan Murphy to Gary Sanchez over the years. Phelps is returning as pitching coach and Mahoney, a former organizational infielder, is moving up from Pulaski. This will be Olivares’ third season in this role. After spend the last three seasons managing the RiverDogs, Dorante will now lead all the young kids in Pulaski. This is his sixth season in the organization and fourth as a manager. Prior to joining the Yankees, Dorante was the Pirates big league bullpen coach from 2008-10. I know going from Charleston to Pulaski seems like a demotion, but minor league coaches don’t get demoted. They get replaced if they don’t do a good job. Dorante is most likely here because the Yankees want him working with specific players. Both Casadiego and Seabol are new to Pulaski. Casadiego is making the jump up from the Dominican Summer League, where he was a pitching coach last summer. This is Seabol’s first coaching job. He’s a rookie. You might remember him from that one game he played with the 2001 Yankees. Fun Fact: At the time of his MLB debut, Seabol was the lowest drafted player ever to reach the big leagues*. The Yankees drafted him in the 88th round (!) of the 1996 draft. He was the 1,718th player chosen. Wild. Ozoa is returning to Pulaski and Russo spent last season with Staten Island. * The lowest drafted player ever to reach the show? That would be Travis Phelps, Staten Island’s pitching coach. Phelps was an 89th round pick in 1996, taken 1,721st overall by the Devil Rays. Three picks after Seabol. Phelps made his MLB debut eleven days after Seabol. The 1996 draft went 100 rounds, though every team other than the Yankees and expansion Devil Rays dropped out by the 84th round. Tampa Bay dropped out after the 97th round, yet the Yankees kept going. Don’t ask me why. It is damn near impossible to find information about GCL coaching staffs, but those are the managers this year, according to George King (subs. req’d). Ortiz played a very long time (1991-2012) and all over the world without ever reaching the big leagues. He had been working as a scout with the Yankees, and is now getting into managing. You know Sojo. He’s had on and off coaching stints in the farm system over the years, including managing High-A Tampa (2006-09, 2011-12) and serving as third base coach with Triple-A Scranton (2014). Sojo was an assistant field coordinator with the big league Yankees in 2015, whatever that means. Also, he managed Double-A Norwich in 2002 before coming out of retirement in 2003 to play with the Yankees after hitting a home run at Old Timers’ Day. Yup. One name you may notice is missing: Tony Franklin. Franklin has spent the last ten seasons managing Trenton (2007-14) and Pulaski (2015-16), and according to Jed Weisberger, he will now be in Tampa full-time as the organization’s position player rehab coach. He’ll work with everyone from rookie ball kids to big leaguers. If a position player is rehabbing in Tampa, Franklin will oversee him. Also moving into a new role is Greg Colbrunn, who sandwiched two stints as Charleston’s hitting coach (2007-12, 2016) around a three-year stretch as the Red Sox’s big league hitting coach (2013-15). Colbrunn suffered a brain hemorrhage in 2014 and left the Red Sox a year later to be closer to his family, who live in Charleston full-time. The Yankees announced Colbrunn will now be a roving hitting instructor, so he’ll travel from affiliate to affiliate to work with all the top prospects in the system. With Spring Training inching closer and closer, the Yankees have announced the field staffs for their various minor league affiliates. Minor league coaches are important! They’re the ones working most closely with the team’s prospects on a day-to-day basis. Here are the 2016 coaching staffs. Almost the entire Triple-A coaching staff is new. Longtime manager Dave Miley was let go earlier this offseason, hitting coach Marcus Thames was promoted to the big league assistant hitting coach job, and pitching coach Scott Aldred was moved into a roving pitching coordinator role to replace the departed Gil Patterson. Pedrique has climbed the ladder the last few seasons, going from High-A manager in 2014 to Double-A manager in 2015 to Triple-A manager in 2016. Phelps was the pitching coach at High-A last season after serving as the Double-A pitching coach from 2009-14. Wilson, the former MLB catcher, is moving into a coaching role after spending the last few seasons in the organization as a scout. Hyde was actually with the big league team last year as the assistant strength and conditioning director. He gets the head job in Triple-A. Mitchell replaces Pedrique and is a new hire. He has big league coaching experience — he previously worked as an outfield and base-running coach with the Braves, Angels, Red Sox, Padres, and Expos — and has spent the last few years managing in Angels and Cubs minor league systems. Mitchell played 202 MLB games as an outfielder with the Dodgers and Twins from 1980-83. Pilittere and Rosado return as hitting and pitching coach, respectively. Pilittere has long been an organizational favorite, dating back to his playing days as a catcher. Tordi moves down a level after serving as a defense coach with the RailRiders last year. Closser, the former big league catcher, moves up a level. He was the defense coach with High-A Tampa last summer. It appears Osborne is a rising managerial star in the system. He joined the organization back in 2014 after managing in independent leagues, and he’s since climbed the managerial ranks from the Rookie Gulf Coast League (2014) to Short Season Staten Island (2015) to High-A Tampa (2016.) Norton, the former bullpen prospect, was the Low-A Charleston pitching coach last year. Slater rejoins the organization after holding various hitting coach/instructor positions from 2012-14. Pacheco has been promoted after working in the GCL last year. This will be Dorante’s third season as RiverDogs manager. Pope has been promoted after spending last year with the new Rookie Pulaski affiliate. 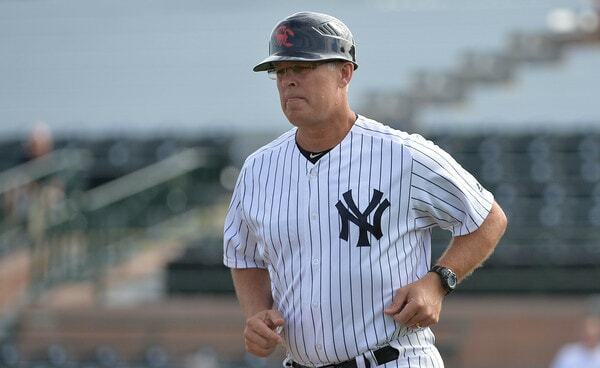 Colbrunn returns to the RiverDogs — he was with the club from 2007-12 as their hitting coach and manager — after spending the 2013-15 seasons with the Red Sox. He was their big league hitting coach from 2013-14 and held another job in the organization in 2015. Colbrunn suffered a brain hemorrhage late in 2014 and stepped down as hitting coach so he could be closer to his family in Charleston, where he lives year round. Hernandez seems to be the organization’s minor league catching guru. He signed with the Yankees as a player in 1998 after defecting from Cuba, and he appeared in five games with the 2003 Yankees before moving on to other organizations. Hernandez has been a coaching coordinator in the system for years and last season the club named him Double-A Trenton defense coach specifically to work with Gary Sanchez. Hernandez’s assignment to the RiverDogs may indicate the now healthy Luis Torrens will spend next season with Low-A Charleston. The SI Yanks didn’t announce their entire coaching staff, just those three names. Bialas managed High-A Tampa last season, so he and Osborne switched jobs. Duncan, the Yankees first round pick back in 2003, will be in his second season as Baby Bombers hitting coach. Farm system head Gary Denbo told Brendan Kuty he hopes Duncan will join the organization in a full-time capacity at some point. Right now he wants to stick with the short season leagues. Oliveras, like Duncan, is returning in the same role. Everyone on the staff was with Pulaski last season except Henry, who was the pitching coach with Short Season Staten Island. Longtime DotF readers will recognize Gonzalez and Rabago from their playing days in the system. Franklin, who managed Double-A Trenton from 2007-14, was moved down to Pulaski last year because Denbo wanted him working with the organization’s youngest prospects. During the first half of the season Franklin is something of a roving coach who travels to the different affiliates to work with players. He then joins Pulaski when the season starts in June. Up-to-date information on GCL coaching staffs is always tough to find — last year’s coaching staffs are still listed on MiLB.com — though Josh Norris did mention former big leaguer Armando Galarraga has joined the organization and will serve as pitching coach with one of the two GCL affiliates. You remember him from the botched perfect game. Galarraga retired as a player last year and was at the Winter Meetings looking for a coaching job in December, and apparently the Yankees hired him. He’s never been in the organization as a player to anything, so he must have impressed during the interview. Cool.